Are you an animal lover? Or, do you know someone who is one? If so, there is a humorous little book available from Random House that you might be interested in getting. 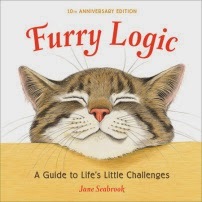 Jane Seabrook is the creator and artist of the Furry Logic series. The Furry Logic 10th Anniversary Edition is the 9th book in the series. It is a small, hardback book with adorable paintings of all kinds of animals including cats, owls, frogs, lions, penguins, bears, ostriches, and many others. Each colorful painting is accompanied by a short saying or quote, similar to what you might find on a bumper sticker. Some sayings are funny, some are sweet, and some just give simple reminders that we are all unique and its okay to just be you. This is not a religious book. It doesn't talk about God or Christianity, and I don't necessarily agree with all of the sayings in this book. But, it is cute, and it did make me smile. NOTE: I received this book from Blogging for Books for the purpose of this review. The opinions I have expressed are my own.